Being a role model for Jamaica’s youth is just as important to this steeplechaser as earning an Olympic or World Championships medal. 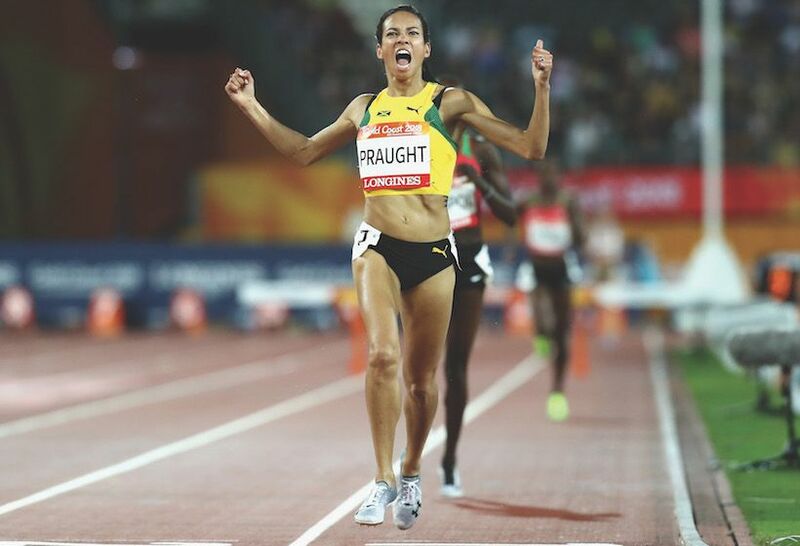 “Accidental” is the term Aisha Praught-Leer uses to describe her foray into running. Once a sprinter and high school cheerleader, Praught-Leer made the transition to long-distance running before college and to steeplechase while running for Illinois State University’s Division I team. Though the 28-year-old Under Armour athlete was raised by her mother and stepfather in Illinois and is currently based in Boulder, Colo., Praught-Leer made the decision in 2015 to race for Jamaica in recognition of her birth father and heritage. 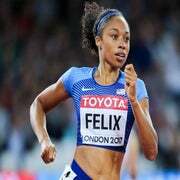 She’s now one of Jamaica’s most promising steeplechase athletes, with a recent win in the books from the Gold Coast Commonwealth Games in the 3,000-meter steeplechase and the 2020 Olympics well within her sights. What first inspired you to start running? I fell into running accidentally. I had been a cheerleader in high school and a sprinter on the track. Our cheerleading coach got fired, and we felt that it was so unjust that a number of us decided to do other sports. One of my friends convinced me to run cross country. At the time, I wasn’t even sure I could run 3 miles straight. But I decided to give it a go. 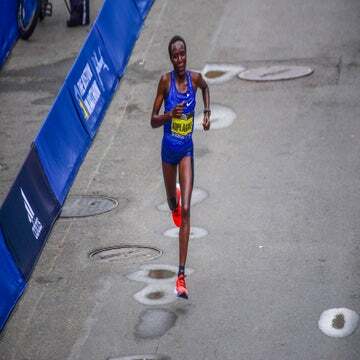 A number of years went by, and I found myself being a professional long-distance runner. It worked, but it wasn’t really a dream that I had for myself at a young age. I sort of lucked into it. How did you make the transition to steeplechase? There was one woman on the [Illinois State University] team who was a steeplechaser, and she was graduating from college. My coach realized, “Well, we have to fill her shoes,” and had every woman run over a hurdle at the end of practice. It was quickly apparent who could potentially train for the steeple and who couldn’t. I fell into the group who could. I was primarily a miler in college. As the years went on, I did more steeplechase and found myself more competitive. I loved the athletic aspect; it’s not just running circles around the track. There are so many intricacies in middle-distance racing, but then you add 35 obstacles to clear. It was such a unique challenge that I fell in love with it. What factored into your decision to run for Jamaica? First and foremost, I wanted all of the people on my immediate support team to help weigh my options and wade through everyone’s feelings and emotions, including my own. It was a difficult decision, but ultimately the biggest motivator for me was the amount of influence I could have on serving the next generation of kids in sport. The U.S. is very lucky in having so many high-achieving, positive role models to look up to. My role as an international athlete in Jamaica is a very influential one, and I knew that was going to mean a lot to me. I get emails from young Jamaican athletes looking for advice and tips because they want to run middle distance. I knew I could be more influential in a country where the number-one sport is track and field, where the number-one childhood sport idols are track athletes. I wanted to have an influence on that realm and be a role model for young kids. I felt that wearing a Jamaican jersey would help me achieve that. How do those young athletes typically reach out to you? The number one way they reach out to me is on LinkedIn. I created an account in college, and some athletes have been finding me on LinkedIn and messaging me, which I think is a cool and enterprising way for young adults to be professional. I wish that I was as confident as some of these young athletes are to just have a question and reach out. I love to be able to give back in that way and help them through training questions and nutrition questions. Do you view that role as a responsibility or an opportunity? That has evolved for me. My first two teams—the 2015 World Championships and the  Olympics—were opportunities to get my feet wet and experience international competition at the highest level. But I wasn’t ready to have all the expectation. Now that I’ve been on the circuit for a while, I see it as a responsibility to perform. I want to prove to young athletes that it is possible to win medals—and not just in sprinting. You’ve been traveling a lot this year to race. What countries or cities have been your favorite to explore, and which are still on your bucket list? I’ve traveled a ton this year, which has been super fun and a little exhausting. Surprisingly, there are still so many places that I want to go. I went to two new places this year, which doesn’t always happen. I went to Australia for the Commonwealth Games, and I’d love to go back and see Sydney and Melbourne. We were in Gold Coast, and that was really cool and laid back, kind of surf-y. I would love to see more of that country. I went to Oslo for the first time this year; I had never been to Norway, and that was a remarkable city. As it goes when we are traveling to many of these places, rest is paramount, and you don’t necessarily get to see much. One of the benefits of being a distance runner is that, when we’re somewhere for a competition, we still need to log miles. I ran in this park in Rome, and it was totally captivating. There were these amazing trees, and it led me to download an app called PlantSnap, so I now can take pictures of plants and identify them, which has become one of my new travel hobbies. My husband and I are actually going on a two-year anniversary trip—we didn’t take a honeymoon after our wedding—so we are going to France in the fall. Paris is one of my favorite places. I’ve never done anything Parisian in Paris; all I’ve done is be a runner. That’s the plan for the fall—to actually experience the city. The biggest hole I have in the map is Asia. I would love to explore Southeast Asia. Those are my bucket-list items. We’re looking toward Tokyo 2020 and thinking, What can we do after the Olympics, when we’re already on that side of the world? I am so lucky that in this profession we get to travel to some of the greatest cities in the world that I never would have been to, if not for this job. When you have a really strong race, like the Commonwealth Games earlier this year, how do you stay focused and keep your momentum going? It’s actually quite hard to do. When we looked up this year, we realized that it was going to be a challenge to have such a big goal early on, relatively, to my competitive season. My coach and I talked about, “What’s that going to look like? How am I going to be able to make it another six months being at the top of my game?” We agreed I needed to take a break. For runners, taking a break is hard. For me, during the first couple of days of a break, I don’t want to take a break. I just have this internal battle every day that I’m only running 30 minutes a day, I’m detraining, getting less fit. But then, halfway through, I realize that it’s actually good, and I need to relax. That was really important. My habit is a two-week break, but we still ran like 40 miles a week. It was just running when I felt like it, enjoying life, eating chocolate cake every day and doing whatever I felt like doing. That helped me. I’ve had a lot of international trips this year. I’ve had a big race every month, and every time I’ve come back, I would take these micro mental breaks; once I achieved something really hard, I’d give myself 24 to 48 hours of just relaxing. Drinking wine with dinner, still waking up at the same time to do my running and training, but just being in the moment, being present and having fun with the people around me before getting back into doing the hard work and heavy labor. That’s been really key for me, to just achieve something, give yourself some space and then get back to it. You can only burn the candle so hard for so many times in a row before you end up breaking. I’ve been able to stay healthy and run decently all year, which is a feat. It’s hard to just keep chasing goal after goal if you don’t give yourself some space to reflect and celebrate little victories. Then you can sink your teeth into the next goal.